GreenRush is an on-demand weed delivery service that gives users access to thousands of medical marijuana products at the tip of their fingers. GreenRush has no physical shop location, but rather is the collection of hundreds of medical marijuana clinics around California. It’s like an online marijuana marketplace. With the GreenRush app (well, technically it’s just a super-mobile-friendly version of their website, due to Apple Store restraints) can browse through hundreds of dispensaries and pick and choose your favorites products. GreenRush will then coordinate having them delivered right to your doorstep, in under an hour, at no extra cost (plus, you can even get $80 in free weed credit, see below). GreenRush is proud to not raise the prices of the products from dispensaries. What you pay is what you’d be paying if you walked into the physical medical marijuana clinic—but with the added benefit of you not having to actually travel there. PLUS. GreenRush is currently the most generous weed delivery service in terms of introductory promotions. They are giving new users $80 in GreenRush credit, which can be used in chunks of $20 at a time (so$20 off the first order and $10 off the next 6 orders). Simply visit via this link, or use the code HAPPY80 during checkout. Your credits will be automatically applied. Many people would be pretty surprised to find out that the answer to the question: Is marijuana legal in California? is—yes, and it has been since 1996. 1996, people! 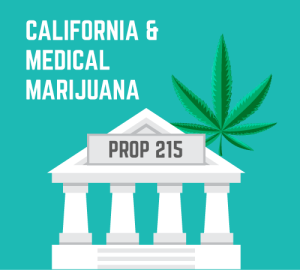 California Proposition 215 (also known as the Medical Use of Marijuana Initiative or the Compassionate Use Act), was on the California general election ballot on November 5, 1996 as an initiated state statute, where it was approved (with a 55% approval vote). Bananas! It seems that only recently the Californian weed industry has gotten attention, but medical marijuana clinics have been quietly and steadily doing their good works for years. 20 years in fact. If you scroll down this article, we offer a list of some of the other popular ways to buy cannabis online—mainly other weed delivery services, all in California. But for us here at WeedSuck, most of our marijuana purchases are done through GreenRush. Why? We just haven’t had a bad experience with GreenRush yet. The nearest dispensary to us is GreenBreeze, and that’s where we usually order from. Their products are TOP notch, and their delivery guys are not only quick, but they’re funny and enthusiastic. It’s an entirely enjoyable experience to order weed online through GreenBreeze, via the GreenRush marijuana marketplace. Another reason we love it is because of the amount of free credits they’ll give you. I mean, $80 as a new user (code: HAPPY80)! And then use existing user code MAYSUCK8 for $8 off $100. They are highly motivated to score your business, and the payout is really given back to the customer. Not to mention the ease of use of their website. Granted, their desktop version is just ok, but when you view the site on your phone it will really blow your mind. Currently, the Apple Store won’t allow weed apps, but GreenRush has formatted their online medical marijuana clinic site to be as good as any app you’ll ever come across (you can even make an app icon on your phone that links to the site so you’ll never even notice the difference). Don’t bother with the fuss of going to a local medical marijuana doctor—you can go to one online, and have the whole thing sorted out in less than 5 minutes! 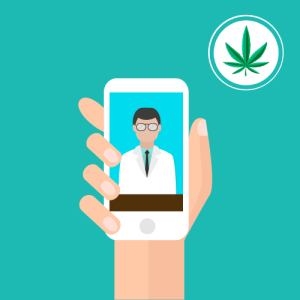 GreenRush has an agreement with HelloMD that allows you to do a video consultation with a cannabis doctor for only $39. The video chat only lasts a couple of minutes, and after that, you get an instant California medical marijuana card that can be used immediately on GreenRush. They’ll also send you a physical copy, which you can use at local dispensaries or upload to other weed delivery services, such as Eaze. As we’ve said before, GreenRush isn’t a store in and of itself. It’s a marketplace that allows you to browse the products of multiple medical marijuana dispensaries near you. And trust us when we say, there are hundreds of marijuana strains on there, from thousands of dispensaries across California. However, you will only have access to the medical cannabis dispensaries that are within range of your desired delivery location. Depending on where you are, it could range anywhere from zero to ten or more. Also, please note that you can only order up to 28 grams (1 ounce) at a single time. You must be 18 years old to order (obviously, it’s the law), and GreenRush also does not accept health insurance for medical marijuana products. All transactions must be paid for with cash only. 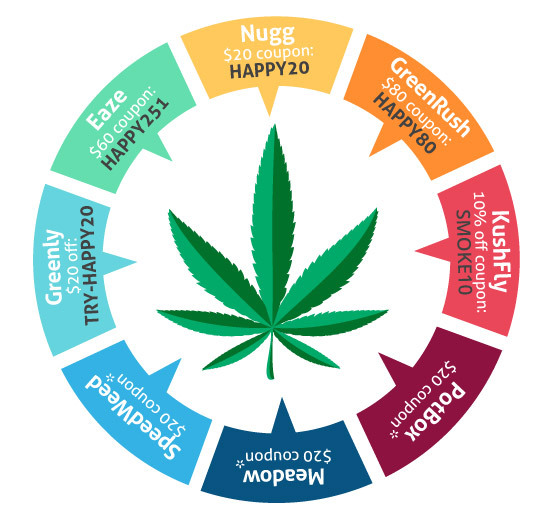 NOTE: Beyond the initial $80 weed credit that GreenRush will give you with the code HAPPY80, you can earn additional free credits by referring friends to GreenRush. Simply sign up for GreenRush, upload your medical marijuana card, and place your first order. You’ll then be able to click the “Refer a Bud” link at the top of the page and get your own referral code. It seems like lots of people use WeedMaps these days. Which is cool if you’re wanting the whole in-person dispensary experience. Sometimes that can be fun—like having a wine guy help you pick out a good wine at the store. Weed Maps can find you the closest dispensary to your house/business, and will also show you reviews, which can be helpful. But sometimes you already know what you want, and you just want the products right away. Or you’re too sick to travel to the dispensary, or you don’t have time, or there might be a million other reasons why it’s tough to make good use of WeedMaps’ information. And this, my friends, is where GreenRush shines. You could place your order in a matter of minutes—hell, you could do it while you’re on the loo if you feel like it. And then it’s only a matter of minutes (well, under an hour anyway) before your delivery is in your hands, delivered to you by a friendly and helpful dispensary delivery guy. While we put GreenRush at the top of our list for favorite weed delivery services, there are tons of others. They all have their strengths, and even better—they ALL offer new user discounts. Obviously, we’ll re-mention GreenRush. Get $80 in credit with the code HAPPY80. Currently, Eaze is one of the more popular cannabis delivery services in California—and they also offer a promo code for a $60 discount (click this link). It gives you $20 off of three separate orders. I like the easy user experience Eaze offers, both on their desktop and mobile versions of their site, and also their medical cannabis recommendation app in the iTunes Apple store, called Eaze MD. Nugg is a close runner up, and also offers a discount. Use code TOPDOWN for $20 off, or click this link. Meadow will give you $20 off your first order if you visit via this link. I recommend starting with GreenRush, then heading down through the list in the order you see above and scoring all the free credits. You can easily rack up over $200 in free weed by trying them all—and then even more from referring your friends to each service. Just in case you’ve read through this whole article and still aren’t sure you want to take the plunge and order some medical marijuana online, we’ll end on some happy thoughts. Here are just a few of the proven benefits of marijuana. Information from LifeHack.com. Slows and stops cancer cells from spreading further. Decreases the symptoms of Dravet’s Syndrome. Lessens side effects from treating Hepatitis C, and increases treatment effectiveness. Helps reverse the carcinogen effects of tobacco, and improve lung health. Improves symptoms of Lupus, an autoimmune disorder. Protects brain after a stroke. Controls other types of muscle spasms. Need proof? Order some medical marijuana products from GreenRush today and get $80 in free credits.